Regular readers will recall our recent feature where we opened the doors to an Aladdin’s Cave of vintage guitar greatness that is the Songbirds Guitar Museum in Chattanooga, Tennessee. As mentioned at the end of that feature, there was a lot more on show at Songbirds than we could possibly fit into one article. So we return now to the museum’s Vault to take a second bite of the cherry with curator David Davidson, one of the world’s most foremost vintage guitar experts. David is a lifelong devotee of Fender’s Custom Colour electrics and the search for guitars clad in scarce and, in some cases, unique Fender factory finishes is his ruling passion. He explains that when you follow the trail all the way back to some of Fender’s first experiments with bolder finishes, you encounter some truly stunning one-off instruments that sometimes heralded the shape of things to come - and sometimes offered tantalising glimpses of what might have been. After decades of meticulous detective work, David has been able to present some of the best examples of rare-finish Fenders that he’s tracked down at Songbirds, a collection of over 500 rare guitars that’s open to the public at a custom-designed premises overlooking the station where the fabled Chattanooga Choo Choo used to pull in to the city. While the museum’s main exhibition halls are stunning in their own right, the best stuff is kept till last in a climatecontrolled Vault at the rear of the building. As mentioned in the last feature, the guitars inside aren’t hermetically sealed away from the world but taken out of their cases for groups of visitors to examine at close hand and, in some cases, play. Part of the reason certain guitars are stored in the Vault area is that its heavily filtered lighting conditions preserve the finishes of guitars in such a way as to give maximum protection from the bleaching effect of sunlight, so future generations can experience the dazzling visual effect Fender’s designers were trying to achieve with automobile paint finishes. But although the Vault is crammed to the ceiling with exotica, it’s not necessarily the most colourful guitars here that have the most interesting history, as David explains as he shows us inside. The very first guitar in the Vault is a relatively unassuming one, appearing very much like any Sunburst Tele. In fact, it’s not a Telecaster and that Sunburst is far from ordinary. 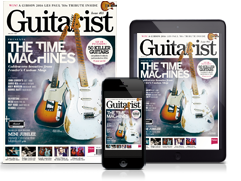 The guitar hails from 1950, when Fender was just finding its feet in the uncharted waters of making solidbody electric guitars. Intrigued by Fender’s all-solid vision for the electric guitar, as compared to Gibson and Gretsch’s traditional archtops, one potential buyer travelled a distance to go and see the guitars at first hand in Fullerton, California, where Fender originally had its manufacturing plant. He had money burning a hole in his pocket - probably one of the earliest cases of GAS-ing for a new Fender - and he wanted to buy a Broadcaster, the name the Tele was originally marketed under. David Davidson picks up the story from there. “A gentleman named Verlin Whitford walked into the Fender plant at Fullerton, which was a small cinderblock building that had a little counter in the front, much like a dry cleaner or an auto parts store,” he explains. “In there, they had a cashier, a cash register in the corner and a parts person or a counter person dressed in a Fender shirt, like a gasstation shirt. “So Verlin Whitford went in there and he was looking for a new guitar that was called a Broadcaster. It was 1950, he was very, very interested, and he was told at the time that they did not have a single Broadcaster available and that they were waiting on some new decals - but they could sell him an Esquire. “Well, he really wasn’t too happy about having a one-pickup guitar, and he explained that he’d made the trip specially, and everything else. So they offered to make him an Esquire and they would put a second pick-up in the guitar for him, which was something that they had done before. As a matter of fact, it’s known that Fender did this eight times: they made eight factory, two-pickup Esquires. “The interesting thing about Verlin’s visit is that because he was disappointed he couldn’t get a Broadcaster, the Fender people were nice enough to take him on a factory tour. So they walked him around, and they walked him down to where amp production was going on, and Sam Hutton was tweaking the amplifiers. And while he was walking around he found a guitar on a workbench, something he had never really seen before. “He found a Fender Esquire that was laying there that was a different colour than he’d ever seen. He says, ‘It looks like a Gibson,’ and they said, ‘Well, we’re just experimenting with this right now, it’s a Sunburst finish, and we haven’t committed to it yet’. So Verlin says, ‘Well, I love it, and can I buy it?’ and Fender told him it was not for sale. They told him ‘We want to perfect it, because it’s kind of ugly right now’. Perhaps because of their relative unpopularity compared to the twin-pickup Telecaster, many of the Vault’s rarest Custom Colour Fenders are drawn from the Esquire model line. In the case of the earliest attempts at Custom Colours, the finishes often don’t conform exactly to the settled, standard hues that we know today, being subtly different shades in some cases - prototype colours, if you will. Like the Oscar Moore Nocaster in Olympic White that graced the cover of issue 428, many were made as special orders to give well-known artists of the era extra stage presence. The Oscar Moore guitar’s unique features went deeper than the finish alone and included an ultra-slim neck. Other customs were simply built to look outrageously cool, in an era in which bold colour ruled. “The 1956 Esquire in this pink colour, which we call Shell Pink, is beautiful - although the chances are it really isn’t actually Shell Pink. But we do have the matching ’54 Stratocaster and both belonged to a female rockabilly guitarist,” David explains. “Both the Strat and the Esquire are Shell Pink or a derivative of that - but they didn’t have formal paint names back then,” David adds. Another Esquire on display is notable not just for its Surf Green finish - far rarer than you might think on an original ’56 Esquire - but for the evidence it bears of a rare screw-up in Fender’s quality control department, which was known for the meticulous care its staff took in making sure early Fenders left the factory exactly as Leo intended them to be. But among all the striking finishes on display in the Vault, one guitar keeps leaping out with its almost Kingfisher-like vividness - one of the most beautiful Fenders we’ve seen anywhere and representative of the close link between guitar finishes and paints used by the US automobile industry in the 1950s. Matching rare guitar finishes to the equivalent car paints they derived from often involves quite a lot of detective work and one stunning 1956 Strat on display at Songbirds is a perfect example of the cross-pollination between the two industries. 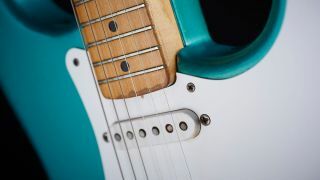 Seemingly a superficial detail, the finishes that Fender applied to some of its early creations in fact shine a vibrant light on the kinds of decisions the company grappled with in its early years regarding what musicians would find appealing. They also highlight what a personal, almost cottage industry Fender was at first - the kind of place where, in 1950, a guitarist could walk in off the street and change history simply by buying a Sunburst electric guitar. If this has whetted your appetite for visiting the museum, a connecting flight from Atlanta reaches Chattanooga in well under an hour. General admission is $15.95, while an all-access guided tour of the Songbirds Guitar Museum including the Vault will set you back $38.95.